This week, Open Doors, the international ministry to the persecuted church founded by Brother Andrew, released its annual World Watch List—the list of the 50 countries that most deny religious freedom and persecute Christians around the world. Listen in as Dr. Scott Rae interviews Dr. Ron Boyd-MacMillan on the state of the persecuted church in 2018. Dr. Boyd- MacMillan is Director of Strategic Research for Open Doors, International, and Professor of Practical Theology and Persecution Studies at Lahore College of Theology, in Pakistan. His research is a major contributor to the annual World Watch List. Scott Rae: You're listening to the podcast, Think Biblically: Conversations on Faith and Culture. I'm your host, Scott Rae, Professor of Christian Ethics, here at Talbot School of Theology, Biola University. Today we're with Dr. Ron Boyd-MacMillan, who is the director of Global Strategy and Research for Open Doors International, which, if you're not familiar with Open Doors, is the ministry to the persecuted church around the world, one of the most prominent parachurch organizations that serves the Persecuted Church around the world. Ron, thank you for being with us; we're delighted to have you with us on the podcast today. Ron Boyd-MacMillian: I'm delighted to be here and to spend some time with you too, and just chatting. Scott Rae: Now our listeners may have picked up a bit of an accent, so tell us a little bit about where you grew up, and sort of what your heritage is. Ron Boyd-MacMillian: We are actually all Scots, but where I was raised in Northern Ireland, in Belfast, actually, at the height of the troubles in the 60s and 70s. And then I was educated in England, and I lived in Holland and Hong Kong and Los Angeles, and I've married an American. So my accent is all over the place, really. Whatever you think it is, you're probably right. Scott Rae: Can you tell us just for a brief moment, I know this is not the subject of our discussion today, but I think our listeners would be very interested to know what that was like to be raised in Northern Ireland in the 70s, and during that time of such tumult and uproar. Ron Boyd-MacMillian: As a teenager, I think you sleepwalk through history. You just don't know what's going on. Your world is small, and you're only worried about what people think of you. And so I didn't notice what was really going on. It was a world of total segregation. I went to a Protestant school. I never met a Roman Catholic the whole time I was in Northern Ireland. I only started to meet them when I traveled around. You just lived in a ghetto, and of course, anything that was said about those outside the ghetto, you just believed. It was the air you breathed. It felt strange really, looking back. My father was a minister in a big church, a big independent church ... Big for Belfast anyway, about 800 people. It was a wonderful formation for me because it was a very working class church. Most of the people worked in the shipyard. There's a big shipyard there called Harlan and Wolff, they built the Titanic, actually. These were hard drinking, hard living men, and they had basically, they were drunkards and they beat their wives. They would get wonderfully saved. You would hear them give their testimony pretty much every week, and you just always saw Christianity works. But it didn't mean that we weren't bigoted. Because, you know, if somebody had come into the church and they had said, "What's your name?" "Oh, I'm Mr. O'Flaherty," that would tell you right away they were ... They'd chase them off, you know? I've always had this sense that the church is a mess. It manages to be a kind of effective mess. My expectations are not so high that everybody has to be just right. Scott Rae: You experienced, from what you saw, redemption being partial? Scott Rae: In some areas, awaiting the Lord's return for other areas. Scott Rae: You have written a lot on the persecuted church. Your book, that I like to make sure our listeners have brought to their attention, World Watch List as well. Ron Boyd-MacMillian: I was trying to give the biggest possible picture in terms of understanding persecution, so the book was answering certain key questions. What is persecution? Where is it going on? What's driving it? How do you do something about it? Perhaps the most significant question of them all is, what can we learn from the persecuted? I was conscious that particularity western Christians see the persecuted as needing their resources. Well, that's true, they do. We do have to send them help. But we also, I believe, have to receive their treasure, because they have discovered something about God in their experience that we need in our own. And so I wanted to build that, a kind of umbilical and discipleship connection between the life of the persecuted church and the life of western church. Sounds rather grand, but that was one of the reasons for writing the book. Scott Rae: Be a little more specific, what specific things have you discovered that the western church, especially needs to learn from our brothers and sisters who are in other parts of the world where persecution is pretty rampant? Ron Boyd-MacMillian: Once I had an interaction with the great Wang Ming-Dao. He was perhaps the most significant figure of Chinese Christianity of the 20th century. He had spent 23 years in jail for his faith, in solitary confinement, much of it. I remember meeting him and I said, "I can't relate to you, you know. I'd go back to Britain, and I don't want to feel guilty for not being persecuted like you, because people died to give me my freedom." I said, "You know, how do I relate to you?" So he thought for a minute and he said, "Well, when you go back, how many articles do you have to write?" "Maybe 10." "How many appointments do you have in the first month? How many people do you have to see?" He asked me all these questions about my schedule, I began to sweat. I thought, "I need to get out of here right now, get back and do all this." Then he just looked at me and he said, "You need to build yourself a cell.” He said, "I was put in jail when I was sixteen, in China you're at the peak of your powers at sixteen. I was a famous Evangelist, I wanted to have meetings all around the country, I wanted to make records, I had a wonderful singing voice, I wanted to write books. I was put in jail and I couldn't do any of that, couldn't read my Bible, didn't give me one. I couldn't write, no pen and paper, couldn't speak to anybody, food was just pushed through the door." And he said, "All I had to do was to get to know Christ.” And he said, "That, over time, became the sweetest relationship of all.” But he said, "I had to realize that up til then, I was this very powerful, famous Christian, but I had served God entirely as a master, even as an emperor. He was my emperor, but he was not my friend.” And he said, "That's what you'll find persecution does; it's not great in and of itself. It's a simplifying force that strips life away of all its distractions, so that it's you and Christ.” And that's the key relationship. He said, "Build yourself a cell. I was pushed into one. You'll have to build yourself one.” I said, "What does that look like?" He said, "Anything that simplifies life, so that it's just you and Christ, even if it's just a technique you use to go into a dark room or something like that for an hour a day. That's the idea.” He left me with this wonderful word; he said, "You know, the key to life is to go at walking pace," he would always say. And I said, "Why?" He said, "Because God loves his garden.” What he meant was wouldn't it be a pity if this beautiful world in which we live in, this kind of Eden, fallen though it is, wouldn't it be a shame if we ran through this garden serving God and didn't walk in the garden enjoying God? That was his grace. I've always kept that and I've tried in my life to have a daily rhythm where I slow down, I simplify, I build myself a cell, and the focuse has to be on actually finding God to be a friend. Scott Rae: It sounds like there's a pretty significant connection between what the men and women, our brothers and sisters, who are trusting Christ in areas where persecution is high. They develop a level of intimacy with Christ that we find a lot harder to replicate here. Scott Rae: The World Watch List is something that Open Doors publishes on an annual basis; it'll be released here in a few weeks [it was on January 9, 2018 at https://www.opendoorsusa.org/christian-persecution/world-watch-list/ ]. You contribute significantly to the research that goes into the World Watch List. 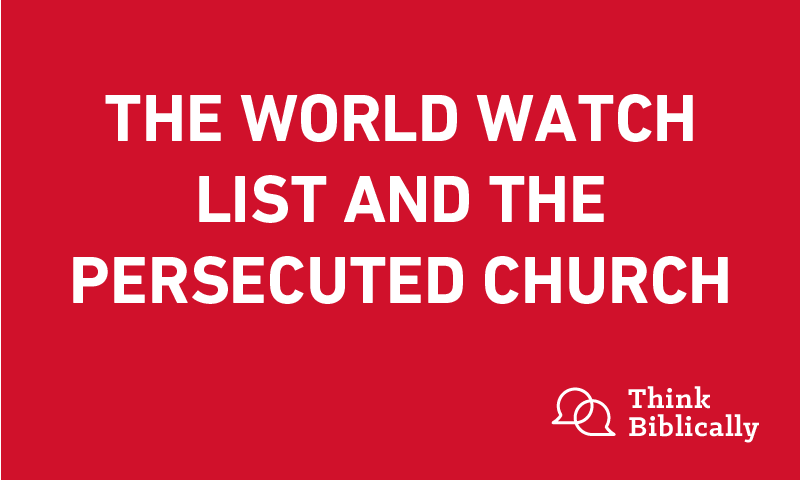 Tell our listeners a little bit about what exactly is the World watch List and what are the criteria that you use to identify the levels of persecution. Who places different countries in the positions they are on that list? Ron Boyd-MacMillian: It's a ranking of the fifty countries in the world where it is hardest to practice Christianity. We use a certain questionnaire with a methodology that expresses our broad understanding of persecution. We talk about squeeze and smash. Most people when they think of persecution, they think of a violent incident. That's true, that's there. Actually if you look at where the violence is, you often find that that masks more significant persecution that doesn't hit the headlines. We talk about squeeze and we say, "How much freedom do you have to express your faith in say your private life or your church life or your community life or your community life or your national life?" These areas are all measured by us. Are you allowed to have a cross on the wall? Could you have a Christian poster in your home? Could you have a Bible in your home? If you don't, then that's a hard squeeze. It reflect the fact that the persecutor doesn't really want to stop you from being a Christian, he wants to stop you from being a witnessing Christian. The squeeze is ten times more effective than the violence; we measure that. We put those two scales together to come up with how difficult it is to live out a Christian faith in a particular context. Scott Rae: It's a really interesting distinction you make between someone who just practices their faith privately and a witnessing Christian. So would it be fair to say that many of the governments and organizations that persecute the church around the world would actually be content with a strictly private faith? Ron Boyd-MacMillian: Yes. Not everyone, North Korea for example, you really have to be worshiping the cult of Kim Il-sung. You’re not allowed to have a private life away from that. But in a lot of other countries, yes, the church is allowed to exist, but keep it to yourself. Keep it underground, keep it quiet. Or what happens in a lot of the Islamic countries is, yes, you are Christians, you’re ethnic Christians. You can stay in the land on one condition only: you never, ever, evangelize a Muslim. That's the deal. The danger is over time, over centuries, it then results in Christians who feel second class. Because they can never really belong in that society. Scott Rae: In some of these Muslim countries, you're a Professor of Practical Theology at a school in Pakistan, so you've spent considerable time in the Middle East, in the Muslim world, can you give us a general state of the church in the Middle East? Ron Boyd-MacMillian: They say if you think of Islamic extremism, it has always had what they call two taproots. It is funded by Saudi money. The Saudis are the most extremist Islamic regime in the world. They have all the money to push it, to sponsor it. Ron Boyd-MacMillian: Yes, it's tight. [inaudible 00:13:52] is really one of the strictest forms of Islam. They will only give aid around the world insofar as it must come with a mosque and we have to send a teacher for that mosque and this kind of thing. You're seeing that all over Africa. They tend to fund extremism. But if you want to learn to be a violent extremist you have to go to Pakistan, in the madrassas in the North of the country particularly. That's where you get taught how to use weaponry and let of bombs, that sort of thing. Those are the two taproots of Islamic extremism. People talk about ISIS all the time; ISIS is really more a very bloody caliphate that is quite temporary. It's already starting to get pushed back, perhaps in five years time there will be no more area in the Middle East where you have ISIS controlling territory. That was never really the main pressure on Christians. It was really Islamic extremism funded by the Saudis, and the Pakistani arena is the place where you learn to be violent. If you get rid of ISIS it doesn't really make any difference to those two taproots. Scott Rae: It will just, in your view, it will just manifest itself in a different form and different organizations regardless of what else comes and goes in the region. Ron Boyd-MacMillian: Yes, this ideology, it's not all Muslims espouse this of course, but there is a very strict Islamism. So that, for example, if you were a Saudi and you became a Christian in Saudi Arabia, you had better keep that entirely secret. If it is known, you will either lose your head or you will have to leave the country. It's as simple as that. There may be Christians who are Muslim but they will never, ever, express that. That doesn't count as a statistic. You say there's martyrs there, so that must be where the most persecution is. These people are not martyrs, but they have no religious freedom whatsoever. That's how we count that. Scott Rae: You were saying in Saudi Arabia not even a private Christian faith would be allowed? Ron Boyd-MacMillian: If they are Saudi, yes. In Saudi Arabia you have a lot of guest workers there who would be Christian. A lot of them would be Pakistanis, Indians, and that sort of thing. They get a kind of special dispensation to have their own private views. But a Saudi doesn't have that. Scott Rae: You said you're seeing a lot of Muslims in various parts of the Middle East come to faith in Christ in some pretty striking numbers. Scott Rae: Do you make a distinction between Islam and Islamism? Ron Boyd-MacMillian: Yes, I think we do. Some don't and I know that there various views on this. I think there is a point in which Islam tips over into a level of intolerance that just almost refuses to even accept any rights for religious minorities in the territory and is very prone to... always has this threat of violence in the background. That's the Islamism I think that really drives the persecution of Christians. But if all Muslims were violent Islamists, we'd all be dead. So that can't be. Scott Rae: What percentage do you estimate of that 1.6 billion Muslims are Islamists? Ron Boyd-MacMillian: It's hard to say. For example, in Pakistan, that's a country of over two hundred million, it is generally reckoned that violent extremists would constitute 20% of the population, that's huge. Now that's probably not the case in a lot of other countries, but the thing you've got to watch in Pakistan is that every time Friday comes along, you've got to be very careful as a Christian. What is the mullah going to say? Friday prayers. If he incites people, then you're going to have your property burned, or you're going to have to run for your life, or that kind of thing. Every Friday you're always worrying about that. Scott Rae: You teach Practical Theology in a seminary in Pakistan. What is that like teaching, equipping pastors to pastor in a place like Pakistan where persecution is so significant? Ron Boyd-MacMillian: It is a great privilege, there's no doubt that in a setting like this, I would say that most pastors have two characteristics; one, they are exhausted, they are absolutely shattered from the stress and pressure of it all. Trying to be a Christian in a society where every day there are a thousand and one humiliations. The other is that they struggle to have hope. Because they see Islam so dominant, so powerful. And they have been told from their birth that because they're Christian, they’re second rate. So your job really as a teacher is to teach them to feel dignity of what it means to be made in the image of Christ. Lift up their head and give them the space--kind of like what we were talking about with Wang Ming-Dao--give them the space to slow down and make sure that God is a friend. You're not just serving a master. But it is wonderful because some of these people go out and minister in Taliban dominated areas. I have to teach them Homiletics or preaching. They say, "Make sure I can preach a sermon so that they don't get the point, because I need time to leave before they stone me.”So I have to come up with parabolic methods of making sure that the real point will hit later once they've exited the building or the market street or whatever. Scott Rae: Yeah, that's actually tragic, but that's something I think here in the U.S. that we've a really hard time relating to, so that you have to actually teach preaching in a way that allows the point to hit home later. Ron Boyd-MacMillian: In Northern Pakistan that would be the case. I mean, in a lot of other places you can be quite traditional. But certainly in the Northern areas that's where it's very dangerous. Scott Rae: I take it that some of these pastors have become your heroes in recent years. Scott Rae: These are really compelling stories of what people--our brothers and sisters in chains around the world ---are enduring. Why do you think that these stories have such a hard time getting traction among the church in the West and the U.S. and in Europe? Scott Rae: This is too hard. Scott Rae: It's too hard to absorb. Ron Boyd-MacMillian: Yeah. But it's difficult because the hardest thing I find as a writer is how do you express this bizarre paradox that the more you suffer, the more joy they feel? Joy and suffering go together, but it's almost impossible to write about that, or express that. Certainly as a proposition, it sounds just ludicrous. As the story really comes with all its strength and power, I think we might just get an inkling. Scott Rae: The last question for you. What are some of the things that you're most hopeful about as you minister in Pakistan and serve the persecuted church with Open Doors? What gives you hope and encouragement? Ron Boyd-MacMillian: Well, although I wouldn't say it was a hard and fast principle, I've often seen that persecution does promote growth. The Pakistan church is still growing hugely. It's only really in the West that we seem to be missing out. The rest of the world is experiencing an amazing revival. I remember Philip Yancey being asked, "Why is the West missing out?" He said, "Well, God goes where he's wanted.” In these places people love God, they love religion, they love the fact that they're wanting to center life on God. They're anxious and ambitious to make a society much more Christianized. And these are almost ambitions that we're a little embarrassed about, at least certainly from where I come from and I'm from England--living in England. The ideal Anglican Christian is somebody that never talks about their faith. They're almost embarrassed, you just live it out super quietly. My hardest thing in ministry is to be in Pakistan, to travel around China, or Indonesia, or somewhere like that, and then come home. That's the hardest thing, because I'm leaving revival-land for a place where Christianity seems to be dying. My local church, however nice it is, I seem to be taking God's funeral. Ron Boyd-MacMillian: I don't want that to be the last word. Scott Rae: Of course not. Of course not. Ron Boyd-MacMillian: That's my context. I think we can revive if we really listen and appreciate the persecuted. But take their treasure seriously. The faith is beautiful,;it's also hard. Getting that balance will bring us joy, but it's a tough joy. Scott Rae: It sounds like we still have an awful lot to learn from our brothers and sisters in chains around the world. Let me remind our listeners, please continue to lift up the persecuted church in your prayers, watch for the World Watch List when its released here in a few weeks [on January 9]. Ron, thank you so much for being with us today. This stuff is hard to hear, and I appreciate the sober reality that you brought to us. I think that's right, there is no delight in darkness. The good news I think is that the gates of Hell will not prevail against the church. When Jesus laid the foundation, he intended for the church to last forever. Ron Boyd-MacMillian: Yes, if you look at the persecuted today, you'll see Christianity works, even evil gets turned to good. That's always something that is massively encouraging. Because as you look out in the world, it's a wee bit depressing with the trends and so on. But actually, that doesn't stymie God. And the persecuted are there as exhibit A to tell you that even if evil is increasing, it doesn't matter. God's on the throne, and he will bring good out of it.